* Конвертирование в 6 различных форматов: Word (.docx), Excel (.xlsx), PowerPoint (.pptx), текстовый (.txt), CSV (.csv) и изображения (.jpg). * Точное сохранение внешнего вида. * Распознавание и извлечение текста из отсканированного документа на 9 языках, включая русский. * Преобразование больших PDF файлов на высокой скорости. * Автономная и не требует установленых продуктов Microsoft Office и Adobe. * Поддержка PDF с ограничениями копирования и печати. * Встроенный просмотрщик PDF позволяет просматривать PDF-файлы до преобразования. * Преобразование неограниченного количества PDF-файлов одновременно. • PDF is the most popular formats for reading, archive and distribution, while Office formats are must-have for creating and editing contents. Lighten PDF Converter OCR converts PDF files to popular Microsoft Office formats including Word (.docx), Excel (.xlsx), PowerPoint (.pptx), as well as Plain Text (.txt), CSV (.csv) and image (.jpg). Save your time and boost your productivity for your daily work! • PDF and Office are totally different document formats, Lighten PDF Converter OCR will try its best to keep the original contents, formatting, layouts and graphic elements as accurate as possbile. It puts tabular data into the right cell in Excel Spreadsheet, keeps original look and feel of even complicated PDF file in Word document, and preserve layouts in PowerPoint, so you don't need to spend hours tweaking the output file. 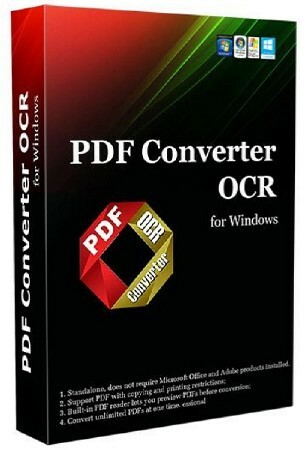 • PDF Converter OCR processes OCR (Optical Character Recognition) for PDF conversion. 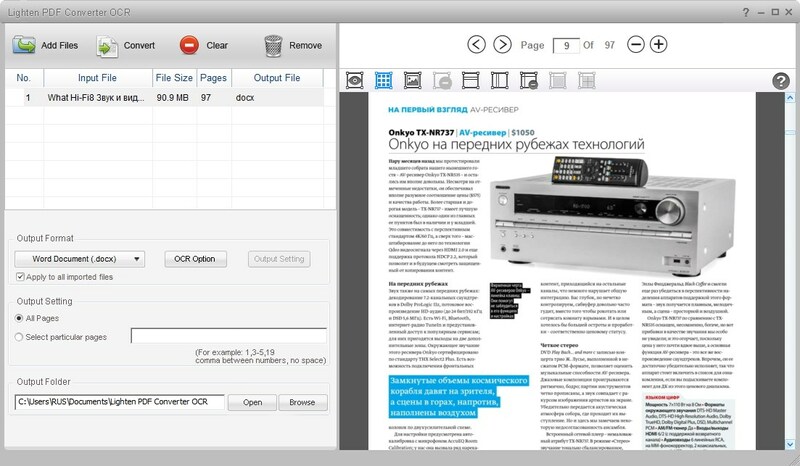 OCR will perform accurate text recognition so it can extract text contents out of scanned PDF file. PDF Converter without OCR can only output image instead of editable text contents in output documents. OCR is now available for 9 languague, including: English, French, German, Italian, Spanish, Portuguese, Russian, Swedish, Polish and Dutch. • Convert large PDF files at high speed, support unlimited PDF file conversion, you can convert thousands of files at one time. With customizable options, you can convert PDF file automatically, or customize output option. For example, you can customize output image quality when you convert PDF to Image, convert all pages to one sheet or different sheets in PDF to Excel conversion etc. • Standalone, does not require Microsoft Office and Adobe products installed. • Convert unlimited PDFs at one time.